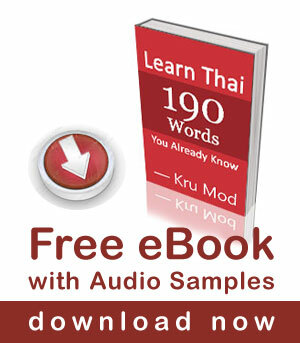 Learn Thai from a song – what’s wrong? Please listen to the song and see below the lyrics I picked up from 00:07 to 00:19. The song is called “Bpen a-rai” by “Royal Sprites”, an old Thai band from 1979. What’s wrong so you are wearing sun glasses? What’s wrong? Who could do this to you, my baby? VOCABULARY : ใคร [krai] = who? น้อง [nóng] = a pronoun used to call someone who is younger than you. In this song the singer refers to his girlfriend. Please tell me, darling do not cry. แก้วตา [Gáew-dtaa] = an old term used to call your loved one. Thank you for your great lessons. To say emotionally unwell, you use jai (heart). What do you use when there’s actually something wrong with your heart? We use the word หัวใจ ‘hua-jai’ to refer to the physical heart, for example เขาหัวใจวาย /kao hua-jai waai/ he had a heart attack. Anyway you could post all the lyrics??? Love this song and want to sing it in the car. I loved the song format for learning. Excellent.